The executive director of a Nicaraguan news outlet that has denounced harassment from the government in recent weeks is now the target of multiple lawsuits. On Dec. 5, Miguel Mora, executive director of the independent news outlet 100% Noticias, was sued by government supporters before the Office of the Public Prosecutor for allegedly organizing and directing acts of violence. Two days before, on Dec. 3, he was sued by family members of government supporters who died and disappeared during the June social demonstrations against Nicaraguan President Daniel Ortega, reported El Nuevo Diario. The family members of the Ortega supporters accuse him of promoting and inciting hatred, violence and death, according to El Nuevo Diario. According to the media outlet, Francis Méndez said that Mora promotes social protests against the current government, including one in which his father Guillermo Méndez Ortiz was murdered and allegedly tortured. Another claimant is Mirlehn Méndez Ventura, the wife of Bismarck Martínez, a worker from the mayor's office in Managua who has disappeared and who allegedly was abducted during one of the June protests, La Prensa reported. "They accuse me of being a murderer, a liar, instigator of lies and hatred in the town," Mora told the site Confidencial after the first denunciations. "The government has a plan to curtail all public freedoms. It is a police, paramilitary State,” he said. In the latest suits, Mora is accused of being responsible for the deaths of Kevin Cruz and Roberto Cortes, from the Department of Carazo, and of destroying the home of Salvador Avilés, inhabitant of Villa Flor Note, according to El Nuevo Diario. Following the first denunciations against Mora, 100% Noticias reported on Dec. 5 that numerous police patrol cars and riot police officers surrounded its facilities. Through a statement on its website, the Nicaraguan Center for Human Rights (Cenidh, for its initials in Spanish) demanded that the "Ortega-Murillo" government cease repression against the independent press and condemned the harassment suffered in recent days by Miguel Mora and Verónica Chávez, owners of 100% News. "The actions undertaken today (Dec. 3, against Mora and Chávez), using the Prosecutor's Office and the Judiciary constitute an obvious criminalization of freedom of expression and independent journalism," Cenidh said. 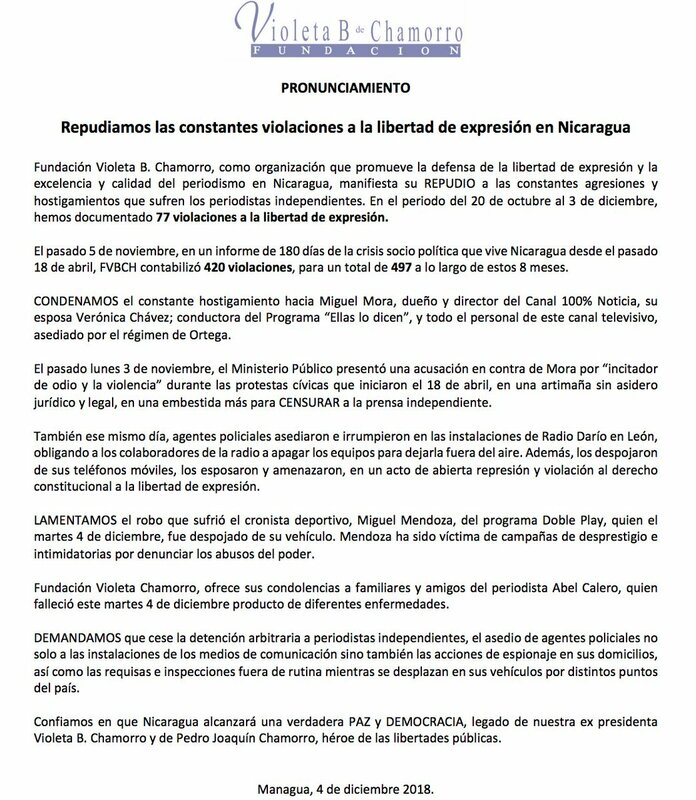 After the first denunciations, the Nicaraguan center of the international organization of writers, PEN, denounced that there is a coordinated action between civilians and government entities to "create a legal artifice, without foundation, to stop" Mora and prevent his channel from continuing to denounce abuses, according to information from the agency AFP. According to the agency, PEN said that the judicial denunciation against the director of 100% Noticias is unprecedented in the country. On its site, 100% Noticias reported that in recent weeks it has been affected by the censorship of its broadcasts. Its cable television signal was replaced by the signal of the official channel and its nationwide satellite signal was withdrawn. Its directors, Mora and Verónica Chávez, have been detained six times in less than two weeks by police forces. On Nov. 30 and in the middle of the street, according to 100% Noticias, Mora was hooded and forced to climb into a police car while Chávez had a gun pointed at her head. The Violeta B. Chamorro Foundation expressed its repudiation of the constant attacks and harassment suffered by independent journalists in Nicaragua. The freedom of expression organization said it had documented 77 violations of freedom of expression between Oct. 20 and Dec. 3 in Nicaragua, including the judicial complaints against the director of 100% Noticias. Another of the aggressions documented was the police raid on Radio Darío in León, which also occurred on Dec. 3. As Nicaraguan journalist and Univision correspondent Tifani Robert published on Facebook, a police group commanded by Leon's police chief, commissioner Fidel Domínguez, broke into the station and handcuffed all radio collaborators. They also removed their cell phones and the four who resisted were taken away, the journalist reported. Roberts said that without any order from the national telecommunications regulator, Telcor, the police ordered the equipment turned off and indefinitely banned radio operators from continuing to broadcast their signal. "At this moment Radio Darío is off the air and all personnel in shelters or hiding places," said the owner of the radio, Aníbal Toruño, who for security had to leave Nicaragua two months ago, reported AFP. Radio Darío was burned down by a crowd of strangers on April 20 of this year, leaving its old premises destroyed. 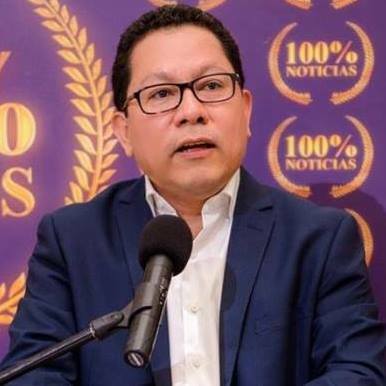 The coordinator of journalism and human rights projects of the Violeta B. Chamorro Foundation, Guillermo Medrano, said that the aggressions against press freedom ranked highest among attacks documented by his organization in the report "Nicaragua: six months of sociopolitical crisis; gray days for independent journalism," La Prensa reported. Now intimidation predominates, he stressed. Via Twitter, the Office of the United Nations High Commissioner for Human Rights in Central America urged the Nicaraguan government to cease persecution and respect freedom of expression in the face of recent attacks on the press.